The view of the confluence of the Colorado and Little Colorado rivers from the NE rim is among the very best in the Grand Canyon. Incredibly this view is little known, probably because of its remoteness and because it lies on Navajo Nation land. The view is so good that the Navajo Nation is considering building a controversial resort called The Escalade at the overlook. The resort would include two hotels and an aerial tram. The tram is expected to carry 4,000 people per day down to the confluence. It is estimated that the resort would employee 3,200 people and could cost as much as $1 Billion to build. If you are opposed to The Escalade project you can sign a petition here. There are two main overlooks of the confluence of the Colorado and Little Colorado Rivers. The first overlook is the proposed site of the Escalade Project and is on Blue Moon Mesa. Blue Moon Mesa is a remote area in the extreme western part of the Navajo Nation. The other overlook is at spectacular Cape Solitude and lies within Grand Canyon National Park. Cape Solitude is normally accessed by a 2-4 day 30 mile plus backpack from Desert View. The great Edward Abbey used Cape Solitude for redemption and rejuvenation of the spirit. Cape Solitude can also be accessed via a long offroad drive followed by a seven mile plus round trip hike. The overlook from Blue Moon Mesa is nearly as spectacular as that from Cape Solitude. It is much easier to visit if you have a 4x4 vehicle and good navigation skills. It can be reached via 30 miles of 4x4 driving, and ten feet of walking. I have been to the Blue Moon Mesa overlook three times and each time I had it all to myself. Each time I car camped undisturbed right on the rim of the Grand Canyon. What an unbelievable experience! There was no indication at the overlook or on the roads to it that a major resort might be built there. I saw packs of coyotes and of wild horses on all of drives to the overlook. Small herds of elk are also in the area but I have not seen any. There are three good viewpoints at Blue Moon Mesa. 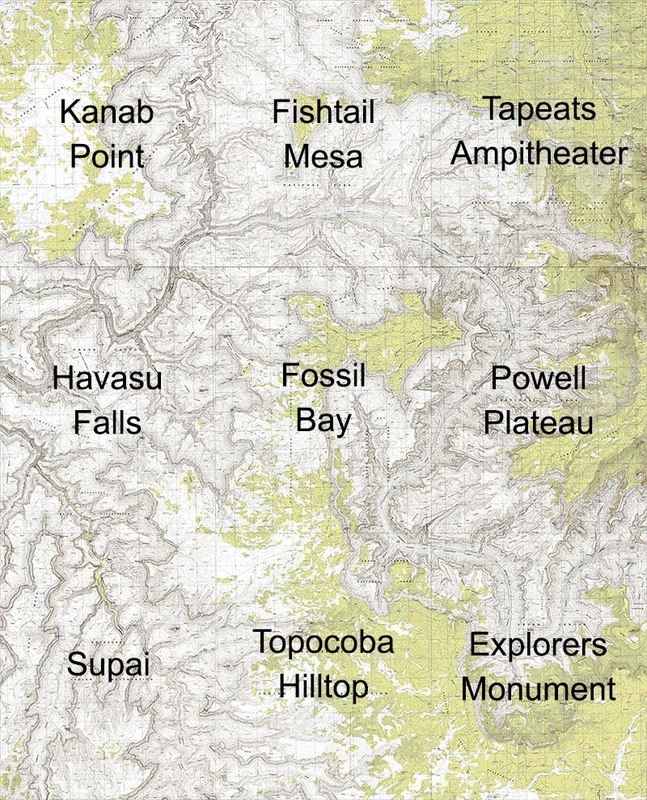 The first and most dramatic one is the center viewpoint on the small map below. This viewpoint is where the Escalade complex would be built. The difficult Walter Powell Route from the rim to the confluence begins near this overlook. The second overlook, to the west, has the best view of the confluence and clearly shows the mixing of the blue Little Colorado and the brownish Colorado rivers. The Little Colorado is usually blue at the confluence, except after a heavy rain when it is brown. The normally turquoise color of the Little Colorado is due to a perpetual spring called Blue Spring from which heavily mineralized water flows at the high rate of 200 cubic feet per second (cfs). The water is very similar in color to that found in glacial lakes, and also similar to that of the much better known Havasu Falls. Blue Spring is 13 miles upstream from the confluence. To see the blue go during a dry period. After a heavy rain the mud in the Little Colorado will change the water's color to brown. The third viewpoint, to the east, has good views both up and downstream of the Little Colorado River. From here you can clearly see the turquoise travertine terraces of the Little Colorado. A few miles upstream of this viewpoint and lying in the Little Colorado Gorge is the " Sipapu", a brown salt dome. The Sipapu is believed by the Hopi to be the location from which their ancestors emerged from the Third World to this, the Fourth World. The Sipapu is one of the most sacred places to the Hopi. Unfortunately it is uninteresting photographically. It is five river miles from the Sipapu to the confluence. The Sipapu is not visible from the third viewpoint, you must descend to the river to see it, or hike upstream from the confluence. There are several trails from the rim to the Little Colorado, all of which are difficult. The easiest is via Salt Trail Canyon, the bottom of which is about two miles upstream from the Sipapu. A good description of the Hopi Salt Trail can be found here. In addition to the overlook at Blue Moon Mesa there are many other little visited overlooks of the Colorado River outside of Grand Canyon National Park. Most of these overlooks are on the Colorado's east rim. 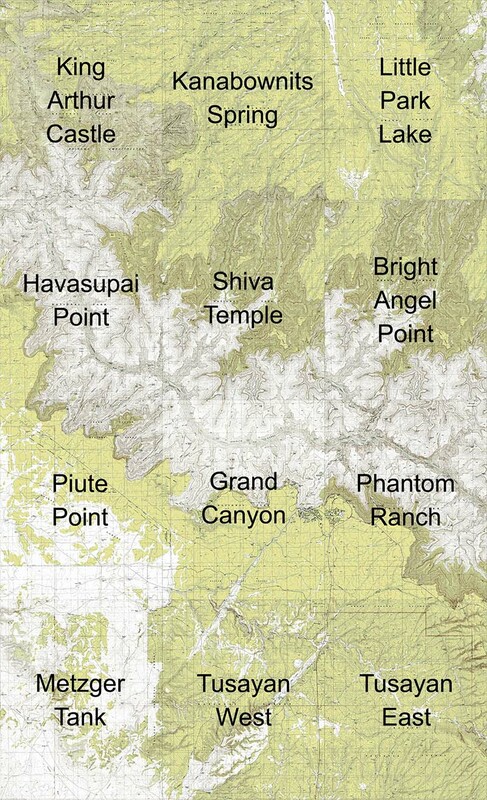 These viewpoints lie in the Navajo Nation and a $12 per person per day permit is needed to visit them. The map below shows some potential viewpoints. The viewpoint of Point Hansbrough from just south of Tatahatso Point is excellent and very similar to that of Horseshoe Bend. I have not yet had a chance to visit all of east rim viewpoints. Do not underestimate these overlooks because they are not formally within the park. Land just across the Colorado River is within park boundaries and has comparable views, but many more people. On the north and west sides of the Colorado river there are also some good overlooks that lie outside the park boundary. These overlooks are on National Forest Service (NFS) land and are accessible via Buffalo Ranch Road off of Highway 89A. Most of these overlooks can be driven to, and you are likely to have the overlook all to yourself. Dispersed at large camping on NFS land is permitted and you can overnight right at the overlook! Finally there are two other good overlooks of the Colorado River Gorge outside the national park. The first is at Horseshoe Bend and is well known, the second is at little known Waterholes Bend. Both are worth visiting. If you wish to visit The Confluence legally or the east rim you will need a Navajo Nation permit. The permit can be obtained in Cameron Arizona between 8 AM and 5 PM Monday to Friday, and on Saturday and Sunday during the summer months. It can also be obtained via mail, see this webpage for more information and an application. I am aware of three different routes to Cape Solitude. Two of the routes start near the Desert View Campground within the Grand Canyon, and one starts off Highway 64. I choose this latter route when I visited the cape as it involves the least hiking and the road, while long and rough, is probably better than the road from Desert View Campground. I believe all three routes cross both Park Service and Navajo Nation land so you need permits from both. It is unlikely either permit would be checked as this area is very remote and there are no houses along the route. I did not see other people during two drives to the cape. Preferred Route - This route to Cape Solitude is the longest route in total miles. It includes a 26 mile offroad drive on National Park Service and Navajo land, followed by a 4-5 mile one way hike to the Cape. The offroad portion of the drive requires a high clearance 4WD vehicle. The route begins on Highway 64 6.5 miles east of the East Entrance to the Grand Canyon. The route is shown on the Cape Solitude layer of the Google map below. The drive follows the red and green and optionally purple lines on the map. The first segment (red line) generally travels east for seven miles to the Navajo Nation boundary. After entering the Navajo Nation the road turns north following Indian Route 6140 (green line) for nearly 17 miles to the fenced park boundary. The road is closed at the park boundary and is signed as such. At the fence you can either hike in to the cape following the now closed road (blue line on the map - five miles one way), or can continue to drive about two miles on an even rougher road to a closer access point (purple line on the map). The total drive from Highway 64 to the closest access point is 26 miles and took me 2.5 hours. The road contains many small rocks and is a very slow go. Allow at least three hours of bumpy dusty driving for the offroad portion of the trip. The straight line hike from the end of the road to Cape Solitude is only three miles, but plan on at least four miles to allow for minor detours on the way and exploration of the rim. Kelsey Route - This route to Cape Solitude starts at the Desert View Campground and travels east following the red line on the map for about ten miles till it joins the route above. I have not driven this route but believe it is rougher than the drive recommended above. The route is shown on page 348 of Kelsey's excellent book "Non-Technical Canyon Hiking Guide to the Colorado Plateau" 6th edition. Backpacking route - This route to Cape Solitude also starts at the Desert View Campground. The route is shown in blue on the map below and travels east following the red line on the map for about ten miles till it joins the route above. The hike is fifteen miles in total one way. Photo Tips - My one trip to Cape Solitude was in mid November which was not optimal. The best images from the cape are looking south along the Colorado River. In November the sun is in the southwest sky leading to quite a bit of haze at sunset. I believe the optimal time for visiting would be at the summer solstice from mid-afternoon to sunset. You should also plan your visit during a dry spell so that the Little Colorado River will be turquoise. You'll need to wait at least a week after the stream gauge in Cameron shows little or no flow, and probably longer. Alternatively you may be able to call one of the charter air companies in Page or one of the Grand Canyon rafting companies and ask them if the Little Colorado is running turquoise at the confluence. Sightseeing flights from Page to the Grand Canyon normally fly along the Little Colorado River. If you are going to visit The Confluence I strongly recommend you car camp at the overlook. It is a long drive to the viewpoint and the dirt roads that get you there can be difficult to navigate even during the daytime. Good images can be obtained at both dawn and dusk, and night photography works well also, especially Milky Way shots during the summer months. If you choose to stay at a hotel relatively close by lodging is available in both Tuba City and Cameron. If you do Cape Solitude as a day hike I suggest you car camp at the trailhead rather than driving out in the dark. While in the area you should also consider visiting the Adeii Eichii Cliffs near Cameron and Coal Mine Canyon near Tuba City. Both early morning and late afternoon are good times during which to photograph the confluence, although much of the Grand Canyon will be in shadow. Unlike many other areas of Arizona summer is a great time to visit. While it will be hot at the overlook no hiking is involved and your car will be nearby. Temperatures at night are moderate and car camping very pleasant. In the summer there is a good chance of dramatic light and weather. Lightning strikes on the north rim can be seen and photographed from far away. Keep in mind that at the overlook you are on a high point so lightning is a significant risk when within a few miles. If lightning is close by get in your car, close your doors and windows, and do not touch anything metallic. Cars are normally quite safe in lightning storms. The roads on the way to the confluence and east rim pond up after heavy rains, and there are several washes that will also run after a good rain. If you go during "Monsoon Season" bring plenty of gas and water as roads may be impassable for a few days after a rain. Desert spoon and various cactus are in bloom during early June in the area and provide excellent foreground. The confluence rim is at 6,000 feet elevation, about 1,000 feet higher than Tuba City, AZ. Due to the elevation difference The Confluence's climate should be about 6-9° F colder than Tuba City's shown here. The Confluence is in a windy area of Arizona so March to May should generally be avoided though there will certainly be days with low winds. At 6,000 feet winters at The Confluence will be cold. Road conditions during the winter can also be iffy. Fall is a good time to visit though I prefer summer. If you plan to descend from the rim via the Hopi Salt Trail October is probably the best month in which to go. The Confluence Overlook is in a very remote and largely waterless area of the Navajo Nation. The Bodaway Chapter House has only 1,700 people (about 500 households) and covers an area of nearly 900 square miles. This translates to two people per square mile, or one household per two square miles. Many of the people live in communities along Highway 89 such as Bitter Springs, the GAP, and Cedar Ridge. These are far from The Confluence. During two full days at The Confluence I never saw another person, in fact I never saw another person within ten miles of it. In the thirty miles of driving to The Confluence I only passed three houses and a few cars. Getting lost or stuck going to or from The Confluence or Cape Solitude, or a car breakdown, could be life threatening. This is especially true in the summer and winter. If you visit The Confluence or Cape Solitude be sure to carry extra water. You should also have a GPS and detailed maps of the area and know how to use them. Some of the roads shown on the USGS topo maps are now impassable, at least seasonally, so you may need maps to find an alternate route. I have a satellite phone in my car at all times. I also have good tires, five-ten gallons of water, extra gas, a high lift jack, and a shovel. Forewarned is forearmed. Below is an overview map showing the drive to Cape Solitude, The Confluence overlook, and several other overlooks along the east rim. Routes to the Confluence Overlook are shown from both the north and south. It is approximately thirty miles from Highway 89 to The Confluence Overlook. The first twenty miles is on a generally good gravel road. This road should be passable in dry weather by two wheel drive vehicles. The last ten miles are on unnamed dirt roads. A high clearance vehicle is required. Four wheel drive may be necessary should you encounter mud. If you zoom in on the Google Map below you will find a myriad of unnamed ranch roads in the area. This can make navigation difficult. You should have topo or other detailed maps with you and a GPS to help navigate the many roads. I strongly recommend you download the routes below and use them during your drive. Note - I have not driven many of the roads shown below and cannot vouch to their quality. I have driven both the northern and southern routes to the confluence. All of my trips the drives to the confluence were uneventful, other than occasional detours due to mud and ponding. I drive a four wheel drive FJ Cruiser.